We checked some exciting things off our holiday to-do list a bit early! And we didn’t forget about you ? Here are five small but mighty features you’ve been asking for. Get in front of your clients more often. Grow your brand’s presence across popular social media channels. Already a Jobber customer? Adding your social channels to your brand is easy. Head over to your company branding settings, and add any of the social networks you’d like included in your branding. Completely customizable, our new general email template gives you flexibility when managing your customer relationships. Now you can send a one-off, company branded email to a client right through Jobber online. Offer personalized promotions, follow up on unapproved quotes, or client follow-up survey feedback—and track it all in Jobber. Sending an email is easy. Go to a client, and under ‘actions’ select ‘create new email.’ Customize your message and send! If you’re using Jobber, these ‘general’ emails will also show up on your client communications report with a new option to see which user sent them. Not yet a customer? Learn more about our client communication tools. Get your clients on the same page. Customize your client reminder text messages to include specific details about your upcoming visit. Client reminders help you cut down on cancellations by reminding your clients of upcoming service appointments. 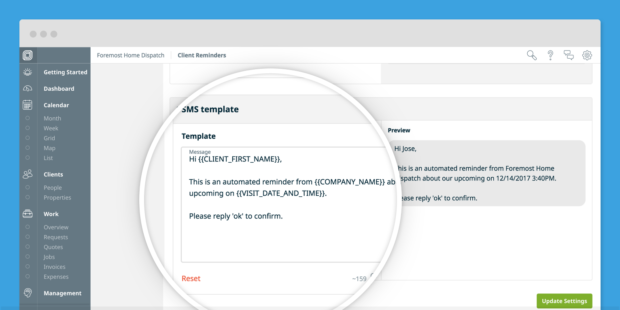 We’ve added the ability to customize your client reminder text messages (SMS) prior to a service visit. Now you can include things like pre-visit instructions, or let them know if you’ll arrive within a window of time. If you’re an admin in Jobber, just go to the client reminders settings to get set up. Use the side-by-side preview view to see exactly what your customers will receive, and save it as your template. Please note that SMS is only available in Canada and United States. Collect consistent job details. 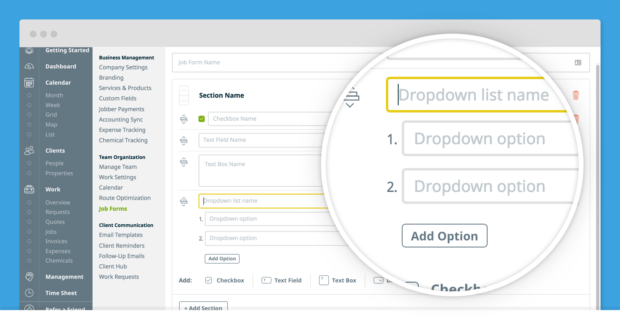 Your team can now choose from a dropdown list when filling out job forms in the field. With job forms you can build things like custom to-do lists, site inspection forms, or service authorization forms in seconds. Now you can add dropdown lists to new job form templates for your team to use in the field. Dropdown lists are ideal when you need to choose from a set list of options. Go to your job forms settings, create your pre-set lists, and your team can quickly pick from the options you’ve entered when they’re in the field. That means less typing for them, and a more accurate view of the work completed each day for you. Get the right kind of feedback to help you run a better business. Client follow-ups let you automatically send clients a reminder to rebook, a request for feedback, or a simple thank you at the end of every job. 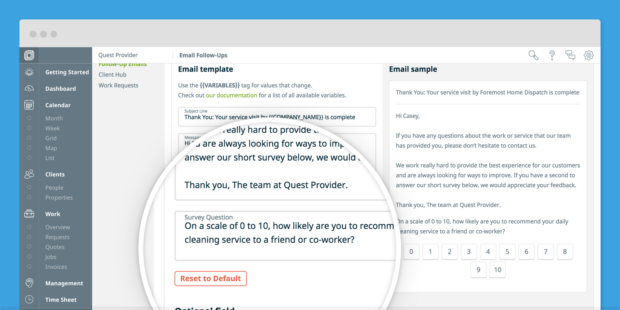 Change up the question in your client follow-up survey to get insight on service quality, employee performance, and more. Administrators will be able to customize the follow-ups survey question asked through the follow-ups email settings. However, you spend the holidays, we hope you have a lovely time closing out 2017! We’ll see you back here in the new year when we share more of the exciting stuff the Jobber team is working on. Will Jobber work for your service business?